Just wanted to take a quick minute and remind everyone about the Austin Teen Book Festival happening this Saturday from 10AM-5PM at the Palmer Events Center downtown. 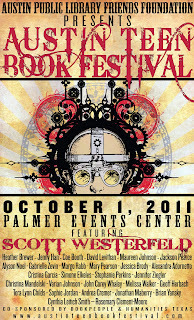 The theme for this year's festival is... steampunk! How awesome is that? Feel free to dress up! Get out your goggles and monocles and hit the town. Or books. Just don't hit the authors, please. The festival will have five panels, and you'll be able to choose three of the five to attend throughout the day. PEN FATALE features Gabrielle Zevin (All These Things I've Done), Mary Pearson (The Fox Inheritance), Jessica Brody (My Life Undecided), Alyson Noel (Everlasting), and Alexandra Adornetto (Hades); moderated by Margo Rabb (Cures for Heartbreak). 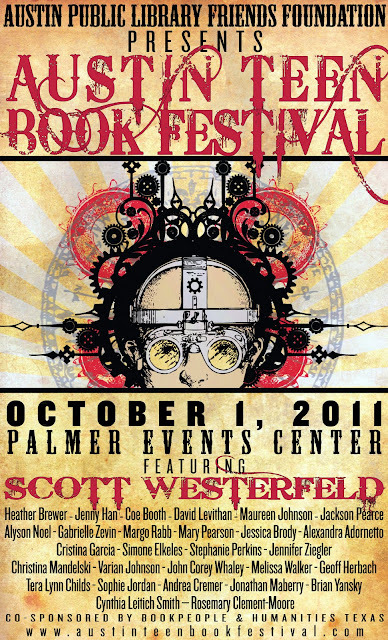 ALTERNAWORLDS (fantasy) features Scott Westerfeld (Goliath), Maureen Johnson (Name of the Star), Jonathan Maberry (Dust & Decay), and Brian Yansky (Alien Invasion); moderated by Rosemary Clement-Moore (The Splendor Falls). REAL LIFE IS MESSY (edgy fiction) features John Corey Whaley (Where Things Come Back), David Levithan (Every You, Every Me), Melissa Walker (Small Town Sinners), Coe Booth (Bronxwood), and Geoff Herbach (Stupid Fast); moderated by Varian Johnson (Saving Maddie). I HEART LOVE STORIES (realistic/romance fiction) features Simone Elkeles (Perfect Chemistry), Stephanie Perkins (Lola & the Boy Next Door), Jenny Han (We’ll Always Have Summer), Jennifer Zeigler (Sass & Sensibility), and Christina Mandelski (The Sweetest Thing); moderated by Cristina Garcia (Dreams of Significant Girls). SUPERNATURAL SUSPENSE (fantasy) features Heather Brewer (Vladimir Tod), Jackson Pearce (Sweetly), Tera Lynn Childs (Sweet Venom), Sophie Jordan (Vanish), and Andrea Cremer (Wolfsbane); moderated by Cynthia Leitich Smith (Blessed). The event is free, but remember it's $7 to park on-site, so bring cash! Also remember to bring cash for lunch (and for books too of course.) Here is a list of what will be available to eat and the price. You can also bring lunch and eat it outside! It should be a beautiful day. There is also a list of books that will be available for purchase (with prices!) on Saturday on the ATBF website. Want to volunteer? We still need you! Click here to to learn more and to sign up. If you have any questions regarding volunteering please email ATBFVolunteer@gmail.com. Some of us bloggers are meeting up Friday night for a bit. Everyone is welcome! Email me (StephanieNPellegrin@gmail.com) for details. We promise we'll be done in plenty of time for the Nick and Norah showing at the Alamo. If you have any other questions about anything feel free to ask me! I'll be there all day Saturday, if you see me stop me and say hello! :) Hope to see y'all there!